Back Bay Books, 9780316167093, 448pp. In October 1934, 30 brave Chinese women left their respective homes to join the Chinese Communist Army and march against the hundreds of thousands of enemy soldiers who had surrounded them. Together with 86,000 Red Army soldiers-including future Chinese leaders Mao Zedong, Deng Xiaoping, and Zhou Enlai-these women embarked on an epic escape, covering more than 4,000 brutal miles in the course of one year. The journey would be one of the most horrific in history, but remarkably almost every woman would live to tell the tale. And then they were forgotten. 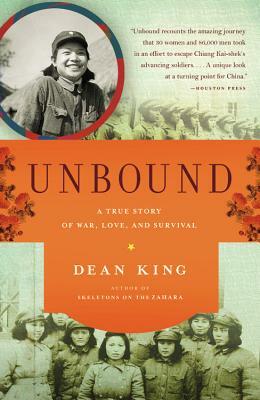 In UNBOUND Dean King reveals the astonishing true story of this tiny group of revolutionaries. A landmark piece of historical detective work and dramatic storytelling, King's book is an unforgettable tale of love, friendship, and survival against all odds. Dean King is the author of the national bestseller Skeletons on the Zahara. He has written for many publications, including Men's Journal, Esquire, Garden & Gun, Granta, Outside, New York Magazine, and the New York Times. He lives in Richmond, Virginia.